In a large pot or Dutch oven add olive oil and sauté onion and garlic for about 2 minutes to soften. Add fennel if you choose, and red wine. Cook for about a minute. Add crushed tomatoes, oregano, basil, red pepper flakes, sugar, and salt. Simmer over low heat for about 30 minutes. In a large saucepan, cook pasta for half of the cooking time. Drain and rinse with cold water. To make the filling, combine cheeses, egg, spinach, and salt in a food processor. Cover the bottom of a casserole dish with sauce. 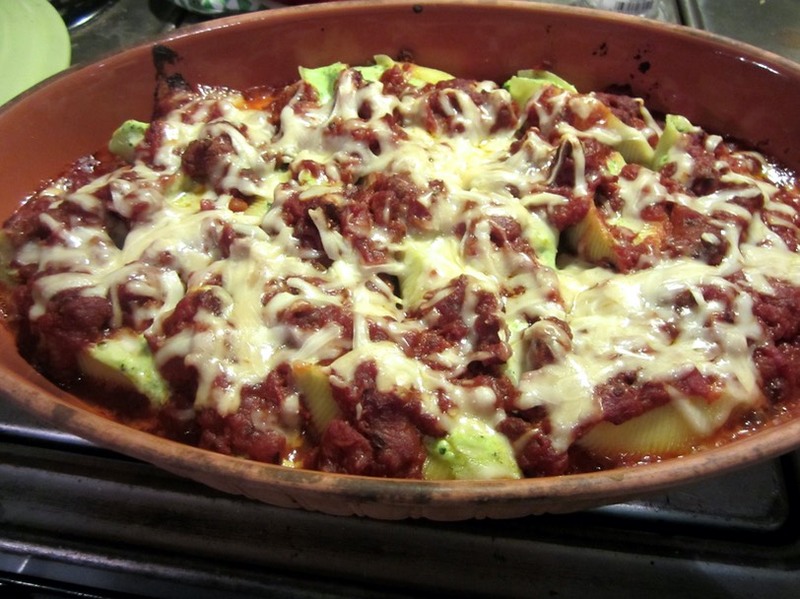 Fill each shell with sauce and place filled side up in casserole. Top with remaining sauce and reserved cheese. Bake 25 to 30 minutes until sauce is bubbly. French bread is marvelous to capture extra sauce!